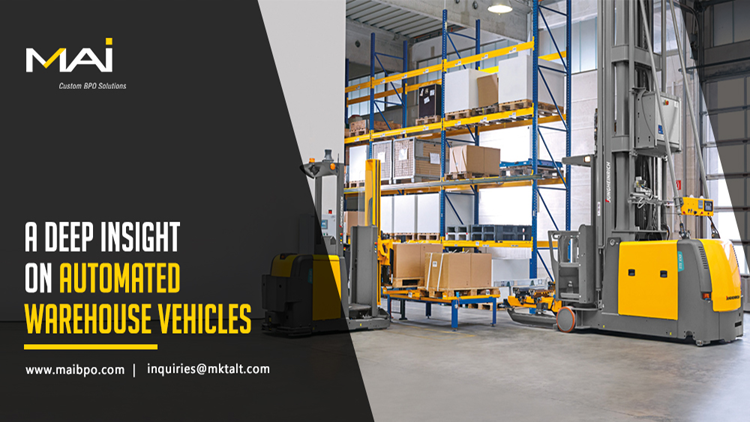 Automated warehouse vehicles are broadly referred to as ‘Automated Guided Vehicles’ or ‘AGVs.’ Depending on the navigation system they use, automated warehouse vehicles are referred to as Vision Guided Vehicles (VGV), Laser Guided Vehicles (LGV) etc. AGVs involve a computer controlled wheel-based load carrier, usually powered by battery, and run unmanned on the factory or warehouse floor (without the need for an onboard driver or operator). The adoption of automated warehouse vehicles is growing at a fast pace due to their role in improving productivity, efficiency and safety – factors that contribute significantly to a positive ROIs. Reduced labor costs : The system knows where products are located and can easily track products in a time-bound environment which reduces costs. Consistency : AGVs promise predictable movement at a consistent speed in an efficient manner. Flexibility : AGVs can be installed into existing facilities with little to no modification of structure or storage systems. AGV systems accommodate physical changes (to the vehicles or environment), as well as changes to the order of the tasks assigned, easily and quickly. Integration : Choosing an AGV with compatible software facilitates integration with other equipment within the facility. Customization : The capabilities of some AGVs can be customized to suit the operating environment and needs of your production unit. There are a variety of vehicle navigations available. Some move by following markers or wires in the floor. Others use vision (camera-based imaging), magnetic guidance or laser guidance for navigation. Choose the type of vehicle that best matches the task it needs to perform. For instance, light load AGVs, Tugger, Pallet trucks, etc. Another important factor is its software and whether the AGV’s program is capable of communicating with existing systems and equipment. It is also important to ensure that the AGV’s program is simple and user-friendly. Battery Charging : There are several choices like Battery Swap, Automatic Charging, Automatic Battery Swap, etc. Maintenance : Be prepared to accommodate spare parts storage and have a plan for addressing regular maintenance requirements. Cost : A thorough understanding of the material handling process at your facility will help pin down the most useful and cost effective AGV. Listing all of the available options against your requirements may help narrow the search to a system which best suits your requirement.